As far as energy sources go, focused solar heat is ancient. In ancient Greece, glass vases were filled with water to create a “burning glass” and as the Greeks got better at creating lenses, focused sunlight was used to light sacred fires and even cauterize wounds. Shattered columns and Egyptian pyramids outside of Paris. Longest canal tunnel in the world, abandoned in the 1960s. One man's fifteen-year diversion lead to a garden of intriguing sculptures. The most famous of these solar powered burning lenses is the system Archimedes is said to have used to ignite a fleet of Roman ships. And it wasn’t just the Greeks and Romans who used solar power lenses either, “Visby” lenses made of ground rock crystal were used by the Vikings in the 1000s, and similar technology is believed to have been used by the Celts and even the ancient Egyptians. 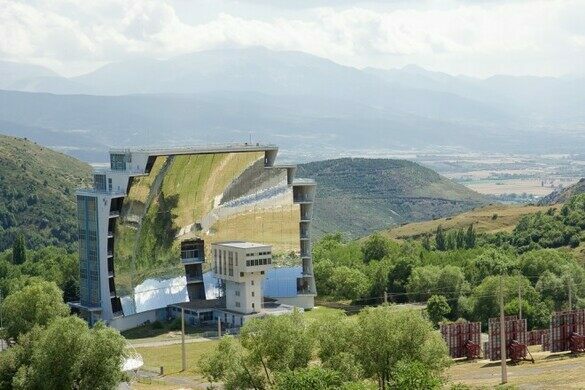 The world’s largest solar furnace is located in Font-Romeu-Odeillo-Via, a commune in the sunny Pyrenees mountains on the French-Spanish border. The furnace consists of a field of 10,000 mirrors bounce the sun’s rays onto a large concave mirror which focuses the enormous amount of sunlight onto an area roughly the size of a cooking pot which reaches temperatures above 3,000 °C or 5,430 degrees Fahrenheit. The solar furnace itself isn’t exactly new. The first modern solar furnace was built in Mont Louis, in 1949 by professor Félix Trombe, and the current one was constructed in 1970. However the solar furnace continues to generate a beam of focused sunlight as powerful today as it was 3000 years ago. The train station, 15 min from the furnace, is also a stop on the Little Yellow Train route, which gives views of mountains and Villefranche-de-Conflent. This 15th century pharmacy displays a beautiful collection of ancient medicine jars. Famed architect Antoni Gaudi built this generous thank you gift to a friendly host who housed him during a job. The world's largest Tesla coil.